Tonight we had a really simple dinner: egg or chicken salad sandwiches, Baked Lays, and applesauce or carrots. (This is how we eat when Meg has practice at 6:00. Thankfully tonight was her last one.) Kade picked the blue applesauce instead of the carrots. He decided to not use his spoon at one point. 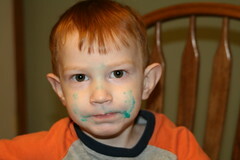 This picture is what he looked like after eating the applesauce. The funny thing is that he said his face wasn't messy. I beg to differ. He's still pretty cute though. The evidence speaks for itself! If you look at his left and right cheeks, you can see the arch of applesauce created by the bowl being stuck right up to his face. It was fun to watch!